The long term future of a theatre in Cornwall could be at risk if funds cannot be raised to pay for vital repair work. The Hall For Cornwall in Truro, which opened its doors seven years ago, is in desperate need of immediate renovation which will cost up to £255,000. Another £100,000 a year is needed each year to maintain the building. The work needed includes roof repairs, damp in the grand staircase, worn seating and lighting equipment. An extra 50p is being added to ticket prices to help build up running funds. This will come into force on 1 April, but a £1 credit card charge will be abolished. The Hall For Cornwall is also applying for grants and approaching various trusts and foundations for funding. 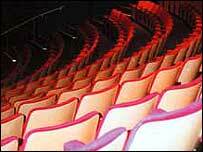 About £25,000 of the £100,000 needed to refurbish the seating has already been raised. Tim Brinkman, the theatre's director, says in many ways the Hall For Cornwall is a victim of its own success. He said: "We have about 170,000 theatre-goers each year and about 716,000 people use the building for meetings and the markets. That's a lot of feet through the building. "The Hall For Cornwall is a charity, so we don't have profits to eat in to, which means we have to raise the money that's needed for the repairs. "We are facing an uphill task. The Hall is not facing closure right now, but if we don't do the work, we would close because Health and Safety regulations are very strict." The Hall For Cornwall has hosted companies such as Rambert Dance Company and the Royal Shakespeare Company, as well as a wide range of entertainers from Bill Wyman and Mike Reid to Coldplay.